17+ years of diversified , multi-national and high profile work experience, a proven innovator, the originator of Arabic, Urdu and Persian language capabilities to the internet. He is a winner of 39 international awards. 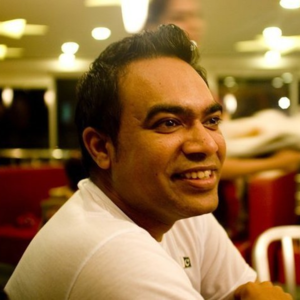 In 2012, Masood won the distinguished MIT Enterprise Forum BAP Award and is an Alumnus of MIT. Raised in a family of mechanical engineers, he brings a combination of expertise in mechanical, electrical and software engineering. His product/user experience, design and problem solving abilities are really valuable to SoloInsight. He has won 39 international awards and SoloInsight Inc, his company, is a Chicago based biometrics technology company that specializes in access control, workforce management, compliance enforcement along with several other cloud based smart solutions. Farhan Masood is sharing hope with me today and so many of you too. You’re going to be impressed by this guy. He has done quite a bit in not much time. Here’s where he’s at. He’s won over 39 international awards, I believe. He started a company called SoloInsight from Pakistan, now brought that to Chicago and he’s back and forth between the countries and all over the world doing many more things. In 2012, I think, Farhan correct me if I’m wrong, but distinguished MIT Entrepreneurs from all over the world joined MIT and you won a competition of over 160 other inventors. Here’s the way I’m understanding your invention and make sure that I really understand it. Don’t tell me the technical stuff because you’ll lose me. But, if I’m watching the movies that I love to watch, the action movies and somebody goes up to get into a secure facility, they put their hand down they get a hand scan, a retina scan or a facial scan and it gives them access to this top secret facility. You’re the guy who really is behind the creation of those high-tech scanning and security features. Is that right? Yes that’s right. We’re actually bringing it to the mainstream. I was in Las Vegas recently for a convention for international franchise association and I’m not a franchisee, just there to learn and I’m not really a big casino guy but I was walking around the casinos and there’s cameras everywhere and the security guys were telling me that they’re actually running your type software there and they can see when a hustler’s walking in the door. They have already known everything about them. They’ve got them. That’s the stuff, right? Yes. There’s the screening systems that are available in the world and we actually differentiate by making them in a 3D space and then in a normal 2D space, so it’s like you can’t really fool the camera. Yes that’s for sure. Well sir, you’re in Chicago tonight. Thanks for your time. I want to respect your time, I appreciate it a lot. It is 8PM right now and we’re talking, so let me jump in to the questions. You know how these work, we ask you the five questions about hope. Answer then however you like and we’re just thrilled that you will be a representative for us in the I Share Hope research project and as we get to share the interviews with lots of other people around the world. Question 1: How do you define hope or what is favorite hope quote? My favorite hope quote is “Hope is being able to see there is light despite all of darkness”. You can actually take the high jump if you know that there is a parachute. You don’t even know if the parachute will be there but you have hope, so you can actually take the leap, take the jumps of your life. Man that’s great. Great points. Love it. Question 2: Who has given you the most hope? If that’s your definition of hope and that’s how you’re thinking through hope and I think that’s an awesome definition, who has been there having your back and making sure that they’re there for you when you needed some hope? There are seven personalities that have actually taken a random leap in my life. One of them is Abdul Razzaq. This guy taught the first ABC when I was a toddler and he took me to 10th grade in school and I figured out one funny thing or one inspiring thing from my parents later on in my life. That all the while he would actually come in a bike and teach me – never been late, never missed a class. Giving me home education and making sure that I succeed in my life. He never took a single penny. There was no tuition fee. It’s like he dedicated 10 years of his life to put me on a path. Another person I definitely refer to everyone, he is a motivational trainer as well in Pakistan where he is very well-known for his book, Qaiser Abbas. There was a time in my life when I was kind of suicidal and somebody gifted me his book. It was in Urdu and that showed me to go out of the way and do all those things, all those crazy things that I have been reading in his book and he has given me a lot of hope. Learned that from his books. His name is Azhar Rizvi. The first time I applied for visa for the United States, I was refused. I was actually told “we don’t want to do business with Pakistan and now you can leave the embassy”. I was really disappointed. My American dream was shattered. I thought that I would never be able to accomplish that dream. He found a way to actually enroll me to an MIT competition that I won. His idea was “Farhan, you should never give up”. “You should always find a way that the embassy could not refuse you with a visa” and that’s what happened. I actually jumped in to this competition and for months and days and nights of believing, I did. Here I am pursuing my American dream today. I met Jeff Hoffman. He is an interesting gentleman who was actually my first ever entrepreneurial mentor. He actually showed me that, oh, you’re actually very – or your company or you’re worth very low. It’s like you’re not worth $100,000, you’re worth more than $10 million. You need to actually pursue your dream, come over to the United States and see for yourself. Don’t settle for less. Then, there’s Jeff Margolis working at the Department of State. Very interesting, he always went out of the way to help me with the visa processes. I won another award in Turkey where he was the organizer. He went out of the way for my visa arrangements as well as he’s been very helpful for me with my career in the United States. After Jeff, I was introduced to Jai Shekhawat. Jai is an Indian living in the United States. Jay has just recently sold his business to SAP for $1.1 Billion. He’s an amazing guy. He is a very successful gentleman. He, for the last 1-1/2 years, has given me continuous guidance and help. He says I can see me in you, struggling and I can do you help. I figured out, I went to Jay and I said, Jay I haven’t really raised the capital that I needed to pursue my dream and that was not possible without your help. I think I owe 1% of my company to him and he said, “You are offering me just 1%?” I said, oh my God he needs more when he said something really wonderful. He said “You have to pay me back but by being very, very, very successful. That’s how you pay me back”. My business partner, his name is Carter Kennedy. He is the person who took me to Jay and he is the person who actually – I really love his ability to run through walls and we had been struggling together and building business together and having fun. That’s a great story. You had so many people really invest and pour so much into you and not just capital, not money, but so much opportunity which is so connected to hope. They’ve given you – you saw where you wanted to go and they just simply opened that gate, opened the door and given you a path to follow and man, that’s great. There’s so many ways that I can turn that into something useful in my life when I’m maybe not starting a company like you are or getting capital investments like you are, but working with a kid I get to mentor or my own kids or somebody in the neighborhood where I can see what’s their passion, what’s their dream and how do I just kind of open the door and clear the path for them, so great examples. What a bunch of heroes. Wow. Definitely and Chris, I knocked on people’s doors. There might be – I’m not naming the hundreds of people who didn’t help me, but I still found these people who helped me out, right? So, you know, you keep knocking on the door, keep asking. So if you ask them there might be a yes. You’d have to be one of the examples there for me Farhan Masood. You’ve opened the door and said yes for letting me talk to you and learn hope from you. We invite a broad range of people from all over the globe and I’m amazed at the people who say yes and I’m one of them. I really, really appreciate you taking what’s given to you and passing it on to me. Thank you. That’s a privilege. Are you in your home in Chicago? Do you travel back and forth? Do you have a home in both places? How does that work? I have now three homes. I have a home in Lahore and I have a home in Chicago and I have a home in Shenzhen in China. I’ve been travelling. Just be careful what you wish for and all my life I’ve been going to palmists and numerologists to figure out if there is a line of travel in my hands. Question 3: Tell me a time, oh you already answered, who’s been hopeful to you and there are seven people in a row. That’s incredible. So, how has worked in your life? You’ve obviously had some really hard barriers to push against in your professional career and I’m assuming in your private life as well, but how do you – tell me a story, kind of take us back to those times when you’ve been like oh my goodness it’s all falling apart and you’ve actually pulled through? One time I remember I called all of my developers and said, I think I’m running out of money and I can’t pursue my dream now and what we should do is – I have enough money to pay you this month, but we are closing down. That’s the worst nightmare. It’s like you start and people say “Oh you’re closing down”. I came out and asked my managers if there is any money in the company and he said sir we have $10 and that’s the equivalent money in Pakistan. We had $10, we actually saved that for the generator fuel. I said okay, you should keep it. It’s like nobody’s. I sat in my car and I looked into – when I started the car, there are two kinds of fuels, two kinds of gas that you use in Pakistan and when both lights are in yellow and red that means there is no hope. So, I was actually driving this car and I said, I don’t care where it stops. Where it stops I’m going to start walking and I’m going to go home and I’m going to sleep. I was very hungry and I looked into my pocket and I had only $1.00. The only dollar left with me and that I spent on buying a shawarma. I bought a shawarma and this is amazing. Food is still cheaper and it’s definitely street food. Instead of putting the fuel of $1.00 in my car, I put fuel in my stomach. I had a little struggle of switching from fuel to no fuel and pressing my feet on the pedal and take them off to be able to make it home. The car stopped and I had to push it over 2 kilometers. You were starting a company, you were running out of money as a company, you’ve got the car, you’re heading home, it’s late, you’ve simply literally run out of gas and you got a dollar in your pocket. You grab something to eat, that’s all you can do, you push your car 2 miles or 2 kilometers home and what do you say when you get home? What are you thinking? When I was going to sleep, I was just thinking, is it me who actually is the 16 people working for me or is it the superpower that actually serves them? Why am I so worried? I should actually go to sleep and God must have caught something about these people. That morning, I woke up with a phone call and he says why don’t you pick up your phone? I’ve been calling you for the last six days. I said I don’t know it’s that it’s an unknown number. I don’t pick up unknown numbers. Maybe it’s the bank for the credit card money that I owe them. They said we have seen your system somewhere. The place was nearby so I reserved 50 cents in my pocket and I met with this guy and he says “Oh Farhan this is you. I’m so amazed this is you.” That is somebody that I’ve known for five or six years. He wrote me a check of $20,000. I had a $20,000 check and my phone which was one-way, it can’t be called anymore. I was excited to tell my team that we’re not closing down and I had to wait for an hour to actually get it to open. That’s one interesting – this is how God works. When you work hard, you really leave everything on hope and something definitely happens. I’ve seen myself many times crashing to zero. There is at least three times in my life that I’ve made a lot of money and I’ve lost all of them, but there is something there for me which I haven’t planned myself. That exists, that comes in my life and that’s what the faith is about. That’s awesome. I’m taking here like crazy, man. That’s really awesome. It really is. A great statement of God really coming through and people have so many different beliefs about God around the world, but so many times you bump in to something that you kind of have to fall back and say there’s a God out there and he’s really looking out for you. I think that’s a great, great story of hope. Excellent. Question 4: How are you sharing hope with people around you today? What do you do on a daily basis to just give hope to people? The way that I’ve been mentored in my life, I’m mentoring others. One thing that I – when I moved from Dubai and I left my job and my career, there was a royal job that I had in Dubai as I was making a lot of money. I decided to move back to Pakistan to actually pursue my dream of building my own technology. It’s like that I would see that there was no Pakistani technologists in the field who is recognized globally and there was no such brand coming out of Pakistan which is global. I wanted to turn that story down. Every time I speak to my countrymen, They think that this can’t be done. They think there is too much conspiracy. I wanted to tell them there is no conspiracy going on. There is no Jewish conspiracy. There is no Indian conspiracy going on. The only conspiracy going on is in your head and your laziness. I wanted a change. I wanted to live by example. I wanted to tell them this could be done and that is when I came back to Pakistan. It’s like our politicians have never done a good job. They have left the country in worse situation. 200 million extremely talented people. It’s like you won’t find such talent anywhere and they’re lacking opportunity. They don’t have any opportunity. They don’t have hope. They are told that you are not going to be successful. You get up in the morning and try something new. Business is not for you, you should not be an entrepreneur. That’s what I wanted to change. I started going to different universities, I started speaking and told I could promote entrepreneurship and live by example. There are a lot of examples now. I am very excited to see that there are a hundred people that I’ve mentored. Wow. Man, that’s really great. So, you’re giving so much opportunity to people there in Pakistan that would have never had that door open if you hadn’t opened it for them. That’s great. It’s the same thing that the guys did for you, the seven you mentioned earlier. Hope is one of those renewable resources and the more we use it ironically, the more there is and you’re really doing that. You’re showing how that works. Chris, I will share one more story about somebody in China that I helped. He’s like a multimillionaire in China now. This guy in China almost 10 years ago came to me and he said “I’m working with this company as a general manager and I want to start my own business on the same product that this company is creating. What do you think I should do?” I told him that you should definitely pursue your dream and start it. He says “What if I fail? I won’t get this job again in my life.” I offered him, if you ever fail, you’re going to come back to me and join me. I will hire you in my company wherever I am. You don’t worry, just go try. This guy is like, you know, I don’t even know what job I could offer him. I just gave him hope. You’re really hoping it worked too, right? It worked so well it’s like he’s driving a Porsche in China. It’s like that. That’s great. That’s awesome. What a great story, it really is. It’s amazing when you just give somebody a nudge and tell them they can go do it. It’s amazing how much capacity people actually have. They just need to have somebody give permission to use it. I was reading that somebody gave his friend, who was not getting a job, a Taweez and he just asked him to promise not to open it and don’t see what’s written in it. He became very, very successful ever since he had the Taweez with him in his necklace. After 20 years when he was very, very successful he said let me see what’s written inside. He opens it and it’s a blank page. It’s just…this is hope. This is the hope which actually makes you thrive in your life. It gives you courage. Yes. It’s inside him already. He just needed to find it. It’s just inside. You know Chris, if I ask you, you know there is this little pavement on the road and if I ask you to actually cross this whole pavement without falling down, you would easily do it. If I ask you to do the same thing on the 30th floor on top of the building, you will not do it even though there is nothing changed here. It’s the same size of pavement that I am asking you to walk on. The fear is inside you, the courage can be cured by hope. Yes. Great stuff, man. I’ve got so many quotes I’m writing down. This is fantastic. You should write a book. Question 5: What can we do, just the simple first, second, third steps, kind of the A, B, Cs of hope. How do I start sharing hope and growing in hope just a person? What do I do next? I’m saying we should do whatever it takes. I’m saying even in my Facebook statuses, I try to get into my Facebook statuses to actually give people hope. I always write one thing, “One should never, never, never give up.” You’re only defeated when you give up. Failure is giving up and if you stay in the game and you continue thriving and trying again and again and again, you will always achieve it. Do as much you can for yourself and for others. If you keep mentoring others, that will open up your brain for different ideas for your own self and it will keep you on track. There was this little story of a man walking by the shore and he saw a kid who was trying to save a lot of starfish on the floor. He said, “there are thousands of these starfish, you will not make any difference” and the kid picks another one and throws it in the sea smiling and said “I did a difference to this one”. As many hearts you can touch, as many people you can actually give benefit to or be beneficial to. I think once you have hope, you should stop procrastinating. You should start working. That’s great. Once you have hope, stop procrastinating and start working. Love it. Hope should not only do daydreaming. Oh, I’m very hopeful that I would become very rich. You better do something about it. You have to execute. I kind of keep thinking in my mind, the more I hear from people like you, great leaders from around the world, that hope without action is heartache. That’s what keeps rolling through my head as I hear these stories. Hope without action is heartache. A lot of kids come to me that I have a startup idea, but everybody’s scared to share with people. Anyone can steal an idea, but no one can steal your passion. That passion, that execution and that hope that you have in yourself is the differentiators. That’s what makes Dropbox a great company or that’s what makes Google a great company, Facebook a great company. It was all simple ideas. Yes it’s really true. So you mentioned your Facebook account a minute ago. So, a bunch of people behind me who would probably just want to follow along with what you’re doing so how can we track you down? Facebook, Twitter, where are you camping out at? I tweet at FarhanMasood without any space between my name. Same with Facebook, it’s facebook.com/Farhan.masood. Great. Just a dot between the name. Perfect and then your website where we can check out your real company? Nice. So, for those who are listening to Farhan along with me, you need to go check out his website and check out some of the stuff online about this guy. This technology is really, really cool. It will make all these Bourne Identity movies and all that stuff come to life. You’ll realize, oh my goodness they can really do that. All right man, well you’ve just been a privilege to talk to. I’ve got so many notes and we’re going to put all these notes and a full transcript of this conversation at isharehope.com along with the links to be able to find the audio from this episode. So, you’re already listening to the episode, you can share this off your device now or you can jump over to isharehope.com and get a lot more info. Have some pictures of Farhan there as well and some more info about his company, links to his social media and anything else you want to find out about this guy. We’ll try to cram it all in there. Farhan Masood, it’s a privilege in so many ways to talk and learn and take notes and have a lot to think about as I roll through the rest of my evening. So, thank you for your time. Thank you Chris. It was a pleasure talking to you. Pleasure talking to you too. Be safe and keep up the good work. All right, so you’re in Chicago and in Pakistan and in China. How often do you swap locations? You can actually say that I am here two months in China and 15 days in Pakistan and 15 days in Shenzhen. Wow, so that’s how it rotates through. That’s how it rotates through. If nothing else comes in, for example my next trip is planned to Philippines, Australia and Singapore. We’re going places. We actually created a product called Cloud Gate. It’s like we named after the Chicago’s cloud gate. It’s a security gate which actually passes through clouds. It will make your Facebook profile or LinkedIn profile turn into a visitor ID that you can actually use to enter different buildings. It’s like making it very convenient for people to walk through. It’s like we just signed a partnership deal with Fujitsu. We have added palm wave technology as well. It’s really fascinating. We’re excited to release it by next month. There is a lot of headway we’re getting in for this product here. Wow. That’s awesome. Okay, so you’re a security guy, particularly a cyber security guy. You probably keep stuff pretty tight. Give me just the tips for the right and wrong kind of password and where do I keep it? I have a password on my phone, my computer, my facebook account, twitter account all of all these things and we’re always scared of somebody getting our info. How do we stay safe? Just simple rules. The simple rule of thumb is make sure that when you are typing in your password and do anything, do you recognize that url? Most of the passwords are stolen not by hacking, but by phishing. Phishing is a terminology where somebody creates a similar looking page that he fools you into by clicking it. What happens is, I don’t know ever since I shifted on Mac for the last three years, I haven’t see a virus or heard about it. But in Windows, you are struggling. You are struggling because there are a lot of viruses that are coming in. They end up taking over your browser, so you should be very careful what you click on, what you download. If you are creating a password, please do not make sure that it’s your name or it’s your own, you know… Some people even have a funny password, it’s called “password”. I’ve heard that before. In fact, I heard of a security attorney, an attorney who litigates security breaches talk recently and he says password is the most common password. All right if you’re listening, change it if it’s password.